Science is everywhere in today’s world. It is part of our daily lives. Asking why things happen, how they work and what makes them behave in a certain way is all a part of science. 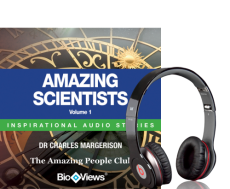 In this collection of inspirational audio stories from The Amazing People Club, five of the most influential scientists share their stories with you. Meet Charles Darwin, Isaac Newton, Louis Pasteur, Michael Faraday and Francis Crick and discover their amazing scientific contributions from their perspective, in the context of their life and times. Discover the life of Charles Darwin as a child as he began to realise the direction he wanted to take his life in. Meet Newton, author of the Principia, which is considered to be among the most influential books in the history of science, laying the groundwork for most of classical mechanics. Enhance your knowledge and understanding of science as well as the people who were behind some of the most important development in this field. Each story comes to life through BioViews® which are short biographical stories, similar to interviews. These unique stories provide an easy way of learning about amazing people who made major contributions and changed our world.